Advocates of the Kansas City Streetcar expansion received welcome news last month when a judge ruled that the new expansion project can be put in the hands and minds of the voters. A group of business leaders and residents of the area are calling for an expansion of the extremely popular current Kansas City Streetcar line. The existing 2 mile streetcar runs through the heart of downtown and saw more than 1 million riders in just 5 months. Now a streetcar advocacy group is pushing to see it expanded an additional 3.75 miles. 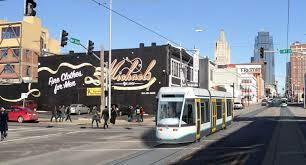 The current proposal would take the streetcar from its endpoint, on Main Street and Pershing near Union Station, down to 51st Street and Brookside Boulevard near the University of Missouri- Kansas City campus. The process is in the early stages and there is still a lengthy timeline for the expansion to be approved. Those residing in the new district will get a chance to approve this project in a three part voting process. Citizens will get a chance to vote on a new Transportation Development District (TDD) in April of 2017. This new TDD would replace the current Downtown TDD. By approving this expansion TDD, it will set up the ability to put a tax to the vote of the people as well as apply for much needed federal funding to get the project up and running. If passed by voters, the next step will be electing the board of directors for the TDD in September of 2017. Finally, the last vote will come in late 2017, early 2018. This final vote will be to approve taxes that will help support the study, design, and build of the expansion. The funding for the project, which is estimated to cost $227 million dollars, will be split between local resident and sales taxes as well as about half coming from federal funding. At this time there is no funding slated from MODOT or the State of Missouri. The proposed local taxes are a 1% additional sales tax in the entire new district, an assessment and special tax on those properties within a 1/3 mile radius of the new TDD, as well as properties in the current Downtown TDD. All taxes would replace the current Downtown TDD tax. The project has received a great deal of support from those in the area, and the goal is to have the streetcar up and running for patrons in 2022.